BullGuard Antivirus is not as popular as the other big-name antivirus products in the market, but that does mean it pales in comparison with these popular providers. Founded in 2001 in Denmark, the BullGuardCompany was launched in 2002 as a security suite provider and was catapulted into success in 2008 when they finally launched the BullGuard Antivirus software. The software was said to first appeal to the community of gamers due to its effective antivirus functionalities, but it did not take long to be recognized as an effective suite that protects against threats and spam mail. Various independent tests have certified BullGuard to be a provider of excellent protection. Included in these tests is the one made AV-Comparatives testing, which has awarded BullGuard and Advanced+ resting for its antivirus and threat detection functionalities. The software has also received high marks for removing traces of malware. However, in tests performed by PCMag, BullGuard was found to have not very high threat detection rates. BullGuard Antivirus ($29.95/ year). Offering solid and complete security and full system performance,this packagedelivers features like safe browsing, tracking and removing system errors, spam filters and antispyware and malware detection. BullGuard identity protection ($39.95). This package does not require installation of the software; you just need to create an online account and then you can protect the critical data and information on any device that you have. Features include parental controls, identity theft protection and social media protection. BullGuard internet Security ($59.95/ year). This package includes licenses for three computers plus free updates when new versions come in, good virus detection rates, parental controls, and 5GB advanced backup for important files. BullGuard Premium Protection ($99.95/ year). This package features multi-layer malware, scareware and adware protection while providing top-rated Internet security, 25GB backup space online and PC tune ups for up to three computers. One of the highlights of BullGuard is its ease of installation and use. Installation is a breeze, and thanks to the small size of the software, your computer’s performance need not suffer. The antivirus program is also very easy to use, with an intuitive dashboard that allows users to easily perform tasks they need to do to make sure that their computer systems are free of infection and threats. 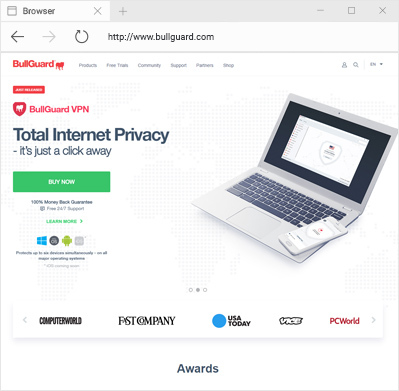 Having BullGuard as your antivirus means being able to run antivirus and vulnerability scans and configuring settings for social media security, identity theft protection, spam filters and even doing computer tune ups with just a few clicks. The different offerings of BullGuard Antivirushave been subjected to different tests, and were all praised by different independent testing bodies for their effectiveness in detecting virus definitions the traditional way. However, for real-time virus scanning, BullGuard rated as just little above average. And because of the software’s additional features, users can expect to have slower computer performance. Perhaps one of the areas BullGuard needs to improve on is the support it gives users. Currently, BullGuard does not offer phone support. However it does make up for this lack through the knowledgebase articles found on its website, and an FAQ section. Users can also opt to get support through chat or email, and they can also purchase support packages for higher-level concerns. Even if BullGuard needs some improvement in terms of customer support and faster PC performance, getting a BullGuard antivirus package is still a good deal. This is because BullGuard’s speed and efficiency in terms of threat detection and removal compensate for whatever is lacking in the program. Depending on the package, BullGuard offers a 15-day, 30-day and 60-day free trial, so users can try out the antivirus and decide if it works for them. Multiple Protection Levels. These levels of protection help maintain your computer system’s health by making sure that it is not affected by different threats. Safe Browsing. This feature notifies the user about suspicious code found in certain websites that, when accessed, can cause harm to the computer system. Highly Customizable Settings. Through this feature, users can make a personalized method of protection as they see fit for their computer system. Malware and Spyware Scans. These scans allow users to detect and block links that can introduce threats to the computer system. Detected threats are flagged so users can decide whether or not to continue accessing the infected website or downloading the malicious file. Comprehensive Email Protection. Even the most basic package offers effective protection for email against spam, so users are sure that whatever reaches their inbox is of importance. This spam filter works with most email providers, which include WindowsLive Mail, Microsoft Outlook, IncrediMail and even Gmail. And while some spam mail can still gothrough the filter, users can be sure that none of their important email communication will ever be flagged as spam by the software. If you are in need of an antivirus program that will give you not just real-time virus scanning, but also a whole lot of other functionalities, you will never go wrong in choosing BullGuard. Depending on the package, you can get a 25GB online storage, identity and financial security, powerful firewall, PC optimization and more, for a single installation.